Seamus O’Brien of the New York Cosmos with Commissioner David Downs. In Part 2 of this interview, Downs speaks to the league’s expansion plans which have been slower than originally expected and states that he still expects more teams to be announced before the 2013 season with the outside possibility one or both would be ready to play next year. He also answers questions about rumors that have been circulating that the New York Cosmos may not be ready to play by 2013, and he addresses the possible name change for the Silverbacks to the Chiefs and speaks to the concerns that some were expressing about that name. IMS: David, we talked several times this season about expansion plans and you had certainly hoped to have a number of new teams announced by now. It seems we are sort of coming down to the wire if new teams will be announced for 2013. Where are we at with NASL expansion? Downs: We very strongly believe we will have two more announcements in the next couple of months prior to the start of the 2013 season. It’s not 100% certain that either or both of those teams would be able to play as soon as 2013. We haven’t totally closed the door on either one of them playing in 2013 so I’m maybe being a bit coy about the way I say that. Obviously we haven’t publicly announced what those teams are. We do want to leave the door open just a crack for the 2013 season to add more teams. And the drop dead date for telling you that there would be new teams added for next year would be our board meeting at the end of October. It’s really then that we will know everything: The fate of the Stars, which teams if any are joining us for 2013, which teams are holding off for 2014, will all be resolved by the time the board meets. It will certainly be the date when we can’t wait any longer for teams that will join the league for 2013. IMS: That date would be so the league can plan for next season I presume and for information that the USSF needs to have? Downs: For everything. For putting the schedule together, for knowing what sort of budget we will have and what funding we will have to make. It all comes to a head on the date. IMS: There were also some rumors in the last couple of weeks that the Cosmos might not be ready by 2013 as they still haven’t announced their venue choice yet for next season. Downs: There’s been no change since the announcement in July and we expect that to be coming imminently. In that announcement they will reference in full details their schedule and ticket packages. That should all be forthcoming by the end of October because it is all one giant puzzle. Obviously it’s a consequence for us too, not knowing if we do a full round robin and how many games we will be playing. IMS: Perhaps something that is a bit more difficult to talk about is a situation that came up with Atlanta. They have evidently acquired the rights to the name “Chiefs,” the old NASL team that played there, so they are having a contest to see what name is most popular with the fans. So in fact the team could be named the Atlanta Chiefs next year. There was already a lose kick back on that, both on Facebook and on Twitter, concerning the use of that name that will be viewed by some as a derogatory toward Native Americans. Has the NASL front office had any talk about that and how do you feel about that? Downs: The NASL has not been involved in Atlanta’s decision to put the name out there and see what the fan reaction is to it. Obviously one form of reaction is this sort of concern and I think it would be wise for Atlanta to take that under advisement. There are many teams out there in the United States that have nicknames that reflect a American Indian heritage. Inherently a team name is supposed to be powerful and noble and all those good things, so I’ve never believed for a second that a nickname that reflects anything that would intended to be derogatory in any way towards anybody. Having said that I’m very sensitive to the fact that it’s clearly in the eye of the beholder and I shouldn’t be the one to be judging. So we will take the feedback that we get and see how that plays out into the overall situation and I for one am not convinced. I happen to think the Silverbacks name is pretty good and they’ve built up some good brand equity. If I was one of the fans voting I’d probably vote to keep the Silverbacks name but I’m not in charge of that situation. In Part 1 of this interview, Downs reveals that the Minnesota Stars FC have two different parties interested in the team at this time. He also disclosed the the league has met with executives of the Minnesota Vikings, not so much for ownership of the Stars but more to talk about soccer and the future of the sport in Minnesota. 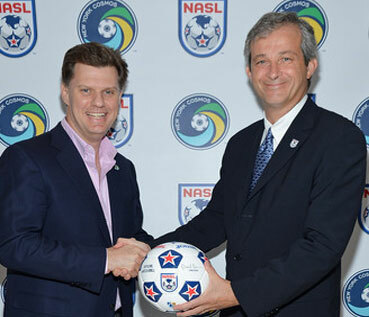 He also speaks to the fan reaction to the news last week that the NASL would be going to a split season format in 2013. « As Teams Enter Final Week of Regular Season, Who’s Hot and Who’s Not in the NASL?